Light-based imaging approaches such as diffused optical tomography (DOT) now allow high resolution non-destructive and radiation-free visualization of breast tissue. However, a surgically biopsy is still required for further tumor treatment. In contrast, optical imaging guided minimal invasive procedure such as mammary ductoscopy offers a new access to the abnormality sites in situ to avoid the traditional surgical biopsy and treatment. Optical coherence tomography (OCT), the feasibility of which has been demonstrated in breast cancer imaging, has the advantage of rapid cellular-level visualization of tissue structures in three dimension as opposed to only surface images provided by conventional ductoscopy. Further on, OCT can be easily implemented in a small diameter needle-like probe for percutaneous procedure, opening the door for diagnostic and therapeutic breast cancer management that is not previously possible. By using an ultrahigh resolution OCT system, it is shown that heterogeneities in the breast tissue unveiled in the OCT images are well correlated with the corresponding histological analysis. In addition, different image processing approaches were developed for feature extraction for various breast tissue types, which can be useful for better visualization of OCT intensity data. awarded as “Best Poster Award” at 2015 SPIE Biophotonics Summer School and “Student Poster Presentation Award Winner” at 2016 OSA Biomedical Optics Congress. Besides academic activities, she was also served as the Secretary of Columbia University SPIE/OSA student chapter in the year of 2015-2016 and is actively involved in various outreaching programs. 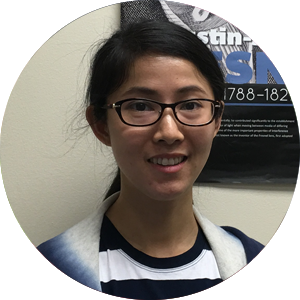 She was also a winner of “Student Officer Travel Grant” at 2016 SPIE Photonic West.